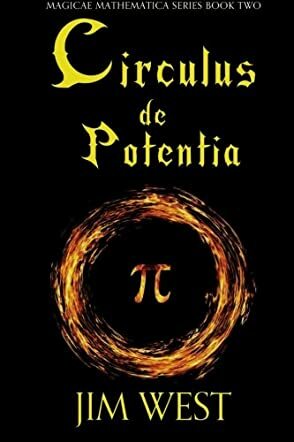 Circulus de Potentia is a magical children’s fantasy adventure written by Jim West, and it forms book two of the Magicae Mathematica series. In a world where magic is derived from the archaic patterns and symbols of Latin and Mathematics, our young hero Alex has already been through plenty of adventures with the great Archimedes (see book one, Libellus de Numeros). Now, a terrifying new challenge awaits as Alex witnesses the Circulus de Potentia in use, an incredible golden band which gives its wearer unbeatable powers. Amid a fantasy world filled with labyrinths, deadly creatures and dark woods, Alex must meet a brand new wizard – the inimitable Pythagoras – in order to solve the riddle and put a stop to the chaos all around her. Author Jim West has taken an incredibly brave risk to base a story for children on the complex principles of ancient Greek mathematics, but it really pays off in Circulus de Potentia. The vivid depiction of philosophers and forward thinkers as real characters in a visceral fantasy world makes all the difference as readers watch their incredible minds figuring out the problems that lie ahead. Alex tips this balance perfectly as a quirky youngster who is keen to learn the answers and put them to practical use, realising that their principles are what stops the whole world falling apart. Overall, this short novel packs a huge wallop of content with brilliant description, stellar character development and a highly unique and educational plot line for readers of all ages. In Circulus de Potentia (Magicae Mathematica Book 2) by Jim West, Diades and Demetrius, former apprentices of Master Wizard Archimedes, were banished from the city a long time ago. The two used their anger and thirst for revenge to craft a formula so powerful that anyone possessing it would take down even the strongest and most skilled of Guardians. The band with the formula was, however, stolen by another enemy of the city with a long-standing personal vendetta to settle. When a mysterious challenger showed up in the city, Alex was called upon by Archimedes and sent on mission that held the only hope of saving the city. The fate of the city is in Alex’s hands and this time she will have to travel into the Forest of Factors, infested with all sorts of challenges and dangers. Alex and her team need to find Pythagoras, the Master Wizard of the Forest, whom Archimedes hopes has knowledge of the secret powers of the mysterious symbol on the golden band, but there are others determined to see them fail in their mission. Will they survive all the threats that await them, find the answers they seek and make it back in time to save the city from the mysterious maniac of a challenger? And will Alex ever find her way back home or will it forever be in her dreams? Once again Jim West brings us a flawlessly developed YA fantasy story with a unique and compelling plot, well developed characters with great depth, and many life lessons for its intended audience. Each of the characters in Circulus de Potentia (Magicae Mathematica Book 2) is unique and adds something special to the story. I was especially fascinated by how Jim West created his characters to be so unique and yet remain very natural. For example, Alex with all her unique skills and powers was still just a young girl yearning for her parents. This gave a natural feel to the story and made the characters easier to connect with. The story is so captivating; it will transport you from here to an enchanting world created by Jim West where mathematical equations hold the ultimate power, and willpower means the difference between life and death. The Magicae Mathematica series is an absolute winner and I can't wait to follow Alex on her next journey in Book 3. Circulus de Potentia is Book 2 of Jim West's children's and young adult fantasy series, Magicae Mathematica. Alex's father is an engineer, and his job involves a lot of traveling for Alex and her mom. When they're at home, Alex helps her mom, who's a veterinarian, at her clinic. It's been some time, however, since Alex has seen her parents, as Archimedes has not yet found a way to return her to her own planet. He promised to do so, but a series of events postponed any progress he might have been able to make. Someone had disrupted the festival that Councillor Etan declared in honor of his nephew, Nosaj. He claimed the right to challenge Nosaj, as the hero of the city, to combat. The Council protested his challenge and offered instead to let him combat one of the 100 Guardians of the City. The mysterious challenger was older and didn't seem that strong, but he wore a golden band on his head marked with the mathematical symbol pi, and he was invincible. Jim West's young adult and children's fantasy, Circulus de Potentia: Magicae Mathematica, Book 2, is a marvelous epic fantasy that just happens to have magic, mathematical concepts and Greek mythology in the mix. While this is the second book in West's series, he includes enough background information to allow this book to be read on its own. That being said, I wouldn't be surprised if most readers who begin with Circulus de Potentia find themselves wanting to read the first and third book as well. West's story is exciting and fast-paced, and the action is non-stop as Alex and Archimedes' other young apprentices go off into the woods in search of Pythagoras. His characters are competent and strong, and watching them solve the riddles of the maze was a pleasure. I had a marvelous time reading Circulus de Potentia: Magicae Mathematica, Book 2 and will be backtracking to read Book 1 -- and I'm looking forward to Book 3 as well. It's most highly recommended. In Jim West's Circulus de Potentia, book two of the Magicae Mathematica series, we start with Archimedes and Diades, wizard and apprentice. Another of Archimedes' apprentices, Demetrius, has fallen in love with Anul, daughter of Councilman Etan and fiancée to the son of Samoht, Semlac. After a tragic turn of events, Diades and Demetrius flee, spending years in hiding, practicing their craft, plotting revenge, and creating the Circulus de Potentia — a gold band of fire and strength. When the Circulus falls into the hands of an unknown and dangerous challenger, it is up to a group of young apprentices, led by an apprentice named Alex, to seek out the Master Wizard of the Forest, Pythagoras. They are then sent to the Labryinthus de Sonim, a mathematical maze which nobody has ever come out of ... and all the while Diades and Demetrius seek to stop her. Jim West's Circulus de Potentia is, frankly, absolutely exceptional. With marvelously detailed imagery and an intelligent story line that blends fantasy and mathematics, West has delivered a literary treasure. While Circulus de Potentia is the second book of the Magicae Mathematica series, it reads easily as a standalone and I was immediately engrossed in the tale without any back-story whatsoever. The dialogue is intelligent, the plot is engaging and perfectly paced, and the characters are convincing and layered enough that I found myself somewhat empathizing with ones I would not have otherwise. It's pretty rare to come across a children's/YA book that is laden with math and Latin, and actually find that it enhances an already riveting story. West has done this — and more — in Circulus de Potentia, which I wholeheartedly give five stars, recommend to readers of all ages, and eagerly wait for the third installment of the Magicae Mathematica series. If after reading the synopsis you have any doubts, know this: Circulus de Potentia is one of the most unique novels on the market for chapter book readers. Our heroine Alex is in for the mathematical adventure of a life time when a golden banded stranger interrupts the local festival. Needing to understand how this stranger can take down the Guardians, Alex will have to go through a maze and find Pythagoras, a wizard who might be able to decipher the strange symbol the stranger bears. Author Jim West is bringing math to young readers in the most magical way possible! I'm in college and this was still a fun read! Jim West presents an educational experience in an exciting and even thrilling way that kids of all ages will thoroughly enjoy. It's well written to always be fast paced, and the characters are simple enough for the younger end of the spectrum to understand them without sacrificing depth and interest. There's another book in the series before this and I feel I must read it, along with whatever else the author ever publishes, because this brilliant. It's creative, one of a kind, and a wonderful read! This is what fiction should be for that age group. Reading and exploring literary worlds should be an educational experience and Circulus de Potentia is just that. I sound like a broken record, but this is a must-buy and a must-read and a must-love. More please!